The flier reads “Come Make History.” I almost threw it out after making some notes on its blank backside. Instead, I stuck it up on my bedroom wall as a reminder. 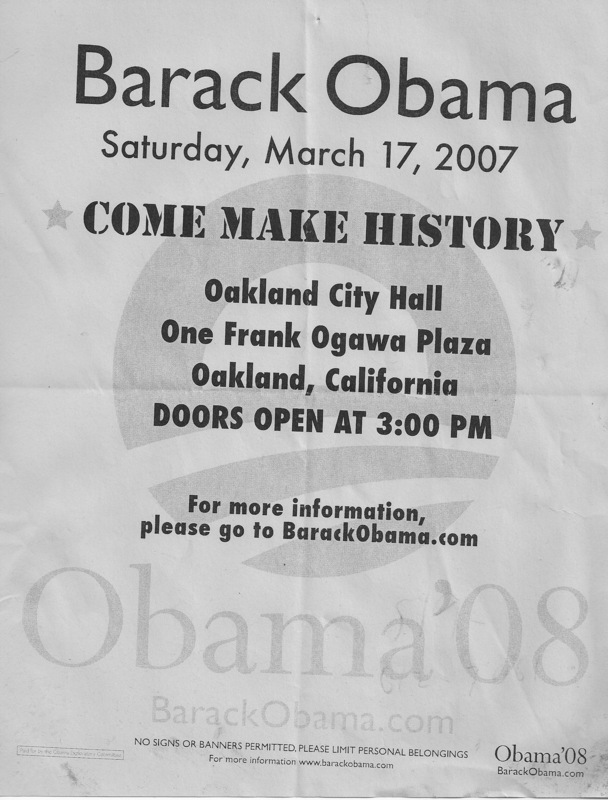 The flier was for then-presidential candidate Barack Obama on March 17, 2007. It was three years ago that I got a chance to see Obama in the flesh. I actually couldn’t see him during his speech. My free ticket only let me into the general area of Frank Ogawa Plaza in downtown Oakland, not close enough to get a view of the podium. After the speech, when the crowd was beginning to leave, I was able to get a closer look and saw Obama walking about the area in front of City Hall, waving and greeting fans. He was well dressed in his white shirt though he was not wearing a jacket or tie. The mood was relaxed, and everyone was having a good time. A number of people had signs that placed an apostrophe between the O and the B in his name (O’ Bama) since it was St. Patrick’s Day. I had enjoyed the speech, though I thought he could never win the nomination, let alone the general election. Well, I never said I had psychic powers. Like many, I was concerned about his lack of experience in electoral politics, but, as I studied his positions on his web site and listened to his speeches, I realized that he had correctly identified the three biggest issues our economy faces today. The first he identified is health care. There are many of us who can’t find affordable health insurance, especially as we get older. I am currently paying for coverage out of my own pocket with $900 yearly deductible. I failed to meet the deductible last year so much of my few medical expenses came out of my pocket. At the end of this month my monthly premium is going up $150. My original monthly payment was $249, so this latest increase will bring it to $421. The reason for the increase is that I will be turning 60 years old. Thanks for the birthday present Blue Shield. Why can’t I buy into Medicare? I would be willing to pay what I am paying now. At least, I wouldn’t have to worry about losing it. What happened to the thousands of dollars my employers and I paid for group insurance when I was young and healthy? They went into the pockets of the insurance companies and stayed there after I was no longer covered. The second critical issue identified by the Obama campaign is energy and climate change. According to military analysts, climate change is a major threat to our national security. Wars over dwindling resources will be common if we allow global temperatures to rise. Millions of people will be forced out of their homes as the result of the loss of arable land, coastal flooding from rising seas, and the lack of clean, drinking water. We have spent billions to fight wars in order to maintain our supply of oil. Then, we have wasted that oil on an inefficient transportation system and throwaway plastics. We have let our public transportation systems rot, making more people dependent on cars to get to work. Jobs have left our cities to places where parking spaces are plentiful and cheap. People in cities who don’t have cars end up with no jobs either. As the finite supply of oil gets used up, the cost of filling gas tanks goes up, too. Meanwhile, the plastics we have been throwing away have been floating in and killing our oceans. The third is education. As the old bumper sticker read, “If you think education is expensive, try ignorance.” We have defunded our schools, especially in those cities where jobs and public transportation are disappearing. Our young people have turned to crime to make a living. Then we spend even more money keeping them in prison than it would have cost to educate them for good paying jobs. Yes, there are good jobs available, even in this bad economy. The problem is that people need education and vocational training to fill them. We wouldn’t need to import high tech workers from India if we just invested in training our own workforce. Investing in our cities would save us money when people can get to work on the local bus. Taxes from expanded economic development would fund education. Young people would not need to sell drugs to earn money. So I find it ironic when people complain that Obama should forget about health care, energy, climate change, and education and work on the economy instead. The only way we can fix our economy and get people back into good, sustainable employment is by dealing with those critical issues. Last night, I was riding my bicycle to a meeting along one of my favorite routes when I encountered a huge pickup truck parked by the curb. A hand-painted sign hung across the entire width of the tailgate with the message that Obama has failed to deliver on his promises on jobs and the economy while mocking his hope and change slogans. The truck looked like it was almost brand new, and I figured the owner was probably not from around here (Berkeley). As I passed by the cab, I looked in to see a middle-aged white man with a crewcut in the driver’s seat. He saw me starring at him and said, “Worst President ever.” I just kept riding. I wasn’t out for a fight. I am sure that his intent was to drive his big pickup into the People’s Republic to provoke a confrontation. I guess if I was that guy in the pickup truck, paying over three dollars for a gallon of gasoline, I would be angry, too. I would hate Obama for not giving me cheap gas and more tax cuts. Sorry middle-aged, white guy in the big pickup truck. Cheap gas and tax cuts got us into this mess. We have failed to invest in our infrastructure, and, worse, we have failed to invest in our citizens’ health and education. Don’t you remember your George W. Bush and Ronald Reagan? Don’t you remember the bills you have to pay for even yesterday?